Fermentation: the process to which every bartender in the world owes a living. Without it, there’d be no whiskey, no wine, no cider and no beer. In short, life behind the bar would be very limited. Broadly speaking, fermentation happens when a strain of yeast or bacteria comes into contact with sugars, and is given enough time and warmth to produce a chemical reaction. Most of the bottles behind your bar are the product of yeast-based fermentation, in which the by-products are carbon dioxide (which is retained in sparkling drinks, vented from others) and alcohol. In the kitchen, meanwhile, the active ingredient is usually lactobacillus, which, instead of alcohol, produces lactic acid – it’s this that creates the distinctive taste of kimchi, the tang of pickled onions and the sourness of yoghurt. 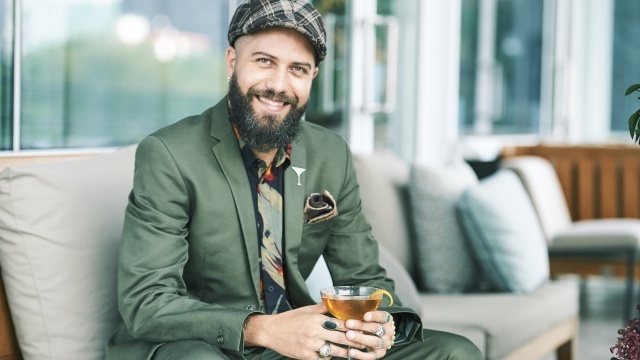 And given that the crossover between bar and kitchen is growing ever larger, understanding and knowing how to make the most of different types of fermented produce can help a bartender take their skills to the next level. But as anyone who’s ever experimented with home brewing will tell you, the art of fermentation goes well beyond simply introducing a microbiological culture to some raw ingredients. You need only look at the different drinks that come from different parts of the world, but are made with the same ingredients, to understand how broad the scope of fermentation is. Take corn, for example – it’s mashed and fermented to create both bourbon whiskey and Colombian chicha, and yet the two drinks couldn’t taste more different. Beyond exciting guests with new and interesting flavours, there’s an extra, more practical advantage for bartenders who embrace the possibilities of fermentation. 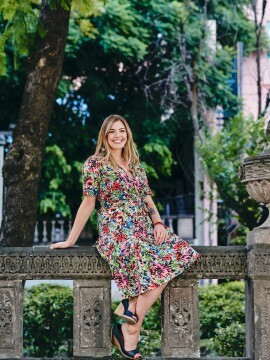 ‘It’s all about understanding food and flavour’, says Lauren. ‘Working with fermented produce is a great way for bartenders to start experimenting with chefs and kitchen teams to increase the efficiency in mise en place creation, perishable storage and flavour development.’ It’s a two-way street, of course – with bar teams thinking about the needs of kitchens and vice-versa, both stand to take advantage of all manner of efficiencies. And then there’s sustainability to think about – consider how a kitchen’s leftover pickle juice could work as a cocktail ingredient, or how a baker might use the yeast-heavy remnants of a keg of beer to make a loaf of bread. Given its versatility and ubiquity across practically every culture on earth, it’s hardly surprising that there are some – Adrián included – who regard fermentation as more than simply a means to an end. Add the citron leaves, syrup and mash, and finally the remaining ingredients to a shaker. Top with plenty of ice and shake vigorously. 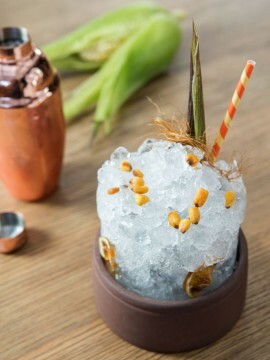 Serve in a Julep glass with a lot of crushed ice, and decorate with the corn leaves and their baked grains. Uncook the corn masa in the brown sugar syrup and add all of the seasonings, if you want to use them. Put everything in a pot preferably of mud, or enamelled metal or stainless steel. Cover with a cloth, and leave to ferment for three days. Remove any foam that has formed on top. Cut the lulo into pieces and place in a jar. Add the sugar, and cover with the fine mesh, then leave at room temperature for four to ten days (depending on the temperature). Once the fermentation point is reached, liquefy, filter, and cool.